The 4th of July is a holiday that holds a special place in my heart because it was the day that my daughter was born. So for me, it commemorates the day that my life changed for the better with the addition of the person I call “my angel”. For most people, however, the 4th of July celebrates our independence as a nation. We celebrate with fireworks, beach parties, barbecues, hot dogs, hamburgers, beer and yummy cocktails. It is truly one of the most fun days for our country because it is capped off by heart pounding and emotional firework celebrations across our nation. This holiday is unfortunately accompanied by the aftermath of some people who over consume alcohol or abuse their home rigged fireworks in ways the makers did not intend. As a result, DUIs and violent crimes increase on this day in most major cities. 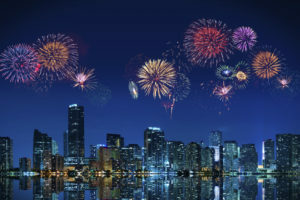 Given that UBER’s fees are greatly increased on holidays such as the 4th, many people may forego UBER here in Miami and drive back home from a barbecue after drinking one too many. If stopped by law enforcement here in Miami, any person suspected of driving under the influence, takes the risk of getting arrested. Even though Miami offers some individuals a program called BOT Court Options, which provides for the breakdown of a DUI to the less serious traffic offense of reckless driving, there are numerous conditions to be completed to successfully complete the program and exorbitant court fees. Moreover, the DUI case remains open for 9 to 12 months which can severely affect a person’s life. DUIs, while serious crimes, do not hold as great a punishment as do most violent crimes. This does not take into account DUI manslaughter cases, of course. Violent crimes that seem to raise in number on this festive holidays are Aggravated Assaults and Batteries and even Murder. The combination of explosives, alcohol and all day parties can be a disastrous recipe for misbehavior resulting in unwanted outcomes. An Aggravated Assault is when a threat of imminent bodily harm is made with an object, other than just words. An Aggravated Battery is when an unwanted touching is created via an object besides a fist or hand. These felonies carry serious penalties: Aggravated Assault (5 years) and Aggravated Battery (15 years). These unfortunate outcomes for most people are usually not the norm, so please do not let this tidbit of information shell shock you to spend the day alone in front of your TV. Just be sure to help a friend home who has had one too many and take away those fireworks from that crazy relative who takes a bit too much pleasure in this holiday! If any one of your friends or family however does find themselves in handcuffs rather than at home, please have them contact The Hansen Law Firm right away.